Are you starting to put together your summer reading list? Check out this list of Midwest-related books perfect for a lazy day in your hammock or at the beach! The State Fair-John Minnis and Lauren Beaver-One of my cousins entered her collections and artwork in competitions at the Michigan State Fair for several years, and I drove her there each year and so she could check out her prize ribbons and share her successes with me. She lives in California now, but we both have fond memories of our trips to the fair, so I sent this book as gift to her late last year. Reading this volume was bittersweet, as former Michigan Governor Jennifer Granholm shut down one of the nation's oldest and largest State Fairs a few years ago, and Detroit's Big Stove, a long-time fairgrounds landmark, burned down after a lightning strike shortly after the book came out. Still, it was fun to recall some of the great memories I have of Michigan's State Fair. The Boy Governor: Stevens T. Mason and the Birth of Michigan Politics by Don Faber-Named one of "Michigan Notable Books" of 2013, this is the story of Michigan's first governor. Mason was a fresh-faced teenager when his political career started in Michigan during the 1830s. Mason was a visionary in many ways, but his meteoric political rise, and equally swift fall from grace that ended in death at the age of 31, makes for a fascinating, yet tragic, look at the rough and tumble politics and history of Michigan's earliest days. History, fortunately, treated Mason far more kindly then most of Mason's contemporaries did and this book explains why. I found Farber's language a little too flowery and stilted for my taste, although I recently heard him give a great, enthusiastic talk about the book and Mason's life at a history conference. The Last Runaway by Tracy Chevalier-I read this book shortly after writing a story about 19th-century Quakers in central Indiana. This historical novel about a young Quaker woman 19th-century Ohio comes from the author of Girl with a Pearl Earring (a historical novel about a woman who modeled for the great Dutch painter Vermeer, which I've also read). This book's main character, Honor Bright, emigrated from England to a new Quaker community near Oberlin, Ohio with her sister in the early 1850s. Honor's sister wanted to join her fiancé and marry him, while Honor sought a new life after her own romantic disappointment back in England. An unexpected tragedy changes everything as Honor begins a new life in Ohio, becomes involved with the Underground Railroad and decides whether to follow her principles or follow her heart. Mrs. Lincoln's Dressmaker by Jennifer Chiaverini-This historical novel tells a story about the events of the Civil War, President Lincoln's assassination and the aftermath of those events from the point of view of Elizabeth Keckley. The real-life Keckley was a remarkable woman, born as a slave, who worked many years to purchase freedom for herself and her son before starting a successful dressmaking business in the nation's capitol. Keckley became Mrs. Lincoln's favorite dressmaker and confidant. It's ultimately the sad story of a broken friendship and Mary Todd Lincoln's personal and financial struggles throughout her life. Author Chiaverini graduated from Indiana's Notre Dame and the University of Chicago and currently lives in Madison, Wisconsin. Four Blue Stars in the Window: One Family's Story of the Great Depression, The Dust Bowl, and The Duty of a Generation by Barbara Eymann Mohrman-I'm always checking out book reviews online for Midwest-related reads, and I found a review of this title on the Nebraska Outback blog. The chance discovery of a forgotten box in a basement that contained family memorabilia sparked a young girl's interest in tracing her family's history from the late 1920s. Mohrman's family survived in the face of the Great Depression, the Dust Bowl and numerous sacrifices during World War II. Published early this year, the book has some great reviews and sounds like one I need to include on my to-read list. Rust Belt Chic: The Cleveland Anthology edited by Richey Piiparinen and Anne Trubek-I read Amanda's review of this collection of essays book late last year on her Clue Into Cleveland blog. The book, billed as an insiders' view of the city from some people familiar to me like the always irascible and irrepressible Harvey Pekar and author and chef Michael Ruhlman who frequently guested on Anthony Bordain's television shows, and many other voices that share the unique stories of renewal, successes, disappointments, and all that is Cleveland. The electronic version of this book sounds like the one to get as it includes an additional 12 essays not in the print version. Whiskey Island and Cleveland Creep by Les Roberts-Amanda's blog also clued me into the existence of two new mysteries in the Milan Jacovich series by Les Roberts. I've featured Roberts' books here in the past as I got Tim hooked on them after picking up the first two books in the series at a bookstore on my way home from a writers conference in Ohio. Cleveland Creep made its way under our Christmas tree last year, and I suspect Tim will get the latest book in the series, Whiskey Island, the next time we visit Ohio. Are there any other Midwest books I should suggest to readers? Young Bruce Catton, who sat mesmerized by the tales of old Civil War veterans in the small northern Michigan town of Benzonia, Michigan, grew up to become a Pulitzer Prize-winning author of many popular histories of the War Between the States. We often visit Benzonia, and once found a particularly tricky geocache in the park where young Bruce played Civil War games with his buddies near the turn of the twentieth century. I knew about the Benzonia/Catton connection, and with the approach of the Civil War sesquicentennial, I thought it was a good time to share the story. In 1858, Reverend Charles E. Bailey and four families from a Congregational church in Oberlin, Ohio, arrived in northern Michigan's wilderness to establish a Christian community with a college modeled after Oberlin. The school began as Grand Traverse College offering classes at someone's home, and later in a two-story frame building in Benzonia. The school offered college preparatory classes and teacher training, accepting students of both genders and of all races and ethnic origin. The school started with 13 students in 1860. That number grew to 150 students by 1875, with many graduates becoming teachers in western Michigan's lumbering towns. In 1891, Grand Traverse College became Benzonia College. Lumbering declined as the forests disappeared during the late 1800s, farming in the area was generally difficult, and the population declined. Benzonia College struggled, lacking students or money, and it became a college prep school called Benzonia Academy in 1900. 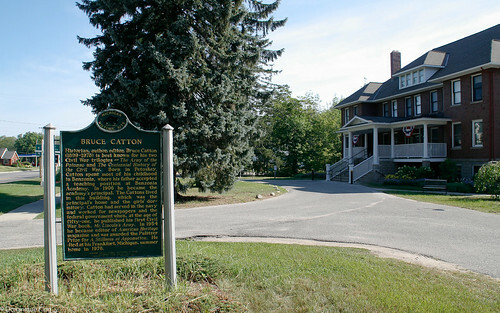 Bruce Catton was born in Petoskey, Michigan. His family came to Benzonia when his father taught at the school and, in 1906, became principal of the 40-student academy. In 1909, Benzonia Academy's main campus building burned down, and school officials replaced it with a wooden-frame and brick-veneer building called Mills Cottage. 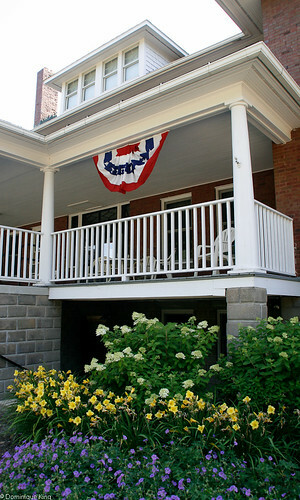 It became the girls' dormitory, central dining hall, and home to Principal Catton's family. Young Bruce Catton had fond memories of old men with long grey beards and wearing blue uniforms with brass buttons that took center stage each Decoration Day (aka Memorial Day) during his childhood. Catton loved the stories they spun about their Civil War days, and history became alive for him as he listened to their tales. Catton graduated from Benzonia Academy and attended Oberlin College in 1916. His father remained principal of the academy until 1917. Benzonia Academy closed after graduating one last class of 10 students in 1918. Catton left Oberlin College to join the Navy during World War I. He worked as a newspaper reporter at the Cleveland News, the Boston Herald-American, and The Cleveland Plain Dealer before moving to Washington D.C. in the mid-1920s to work for a news syndication service. He worked for the Federal government through World War II as a director of information. Catton wrote his first book, The War Lords of Washington, in 1948, leaving his bureaucratic job for his new career as an author. Catton turned to the subject that sparked his imagination as a young boy, writing Mr. Lincoln's Army in 1951. It was the first of his 13 Civil War books. Catton's next book, A Stillness at Appomattox, explored the final campaign of the war in Virginia. It was his first real commercial success, earning him the 1954 Pulitzer Prize for history. His lyrical writing and love for telling stories of the privates, rather than the generals or simply regurgitating dry facts and figures, made Catton's histories popular beyond professional historians and academicians. Catton helped establish American Heritage magazine in 1954. He became the magazine's senior editor in 1959, remaining there until his 1978 death at his summer home in Frankfort, Michigan. His gravesite is in the Benzonia Township Cemetery. Catton wrote about his childhood in Benzonia during the 1970s in Waiting for the Morning Train. 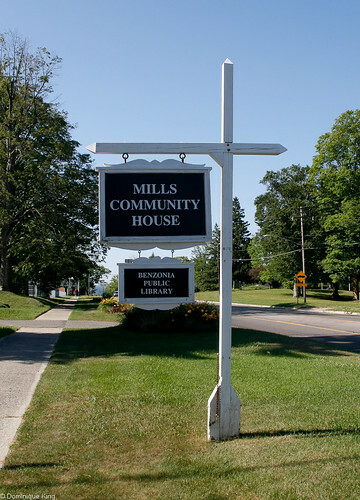 Mills Cottage became the Mills Community House and Benzonia Public Library in 1925. It earned a place on the National Register of Historic Places in 1972. 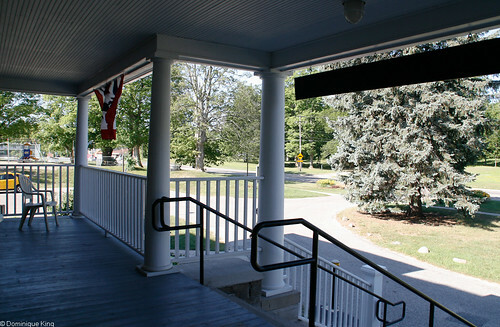 If you're looking for a Wi-Fi connection as you travel in the area, you can sit on the building's spacious front porch and access the library's connection, even when the building isn't open according its website. For the curious, the geocache we found in the park next to the building where young Bruce played Civil War is no longer there, although it remains one of our more memorable finds. It was a two-stage cache where you solved a math puzzled based on information from an historical marker about the academy. The solution led you to a micro cache hidden on the underside of a piece of tree bark about 3/4 by 1-1/2 inches in size and tacked back on the tree with a small hook. Looking for other Midwest locations with a Civil War connection? Check out my story, Brake for Civil War history in Indiana, about a marker at the site of a Civil War training camp. 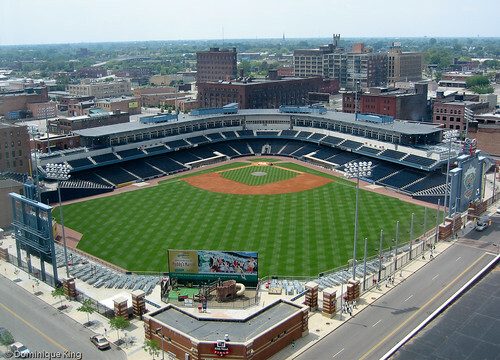 Baseball's First Opening Day-Catch this story at Cleveland Area History about the first major league baseball game. Cleveland Ohio's Forest City team and Indiana's Fort Wayne Kekiongas became the first baseball teams to play in a major league game on March 17, 1871, with the Cleveland team falling 2-0 to the Kekiongas at Fort Wayne. Civic Iconography Done Right: Chicago's City Flag-Aaron writes about Chicago's brilliant use of their flag as an iconic symbol to strengthen the city's visual identity at the Urbanophile blog. You'll find this readily recognizable civic symbol everywhere in Chicago--flying in front of city and commercial buildings and displayed as a logo on everything from city police cars to tattoos on a local bartender's arm. Millennium & Grant Park-I loved reading this story at the designslinger blog about how Chicago's Millennium Park evolved out of an effort to clean up the lake front after Chicago's devastating fire in 1871 and how the original Frederick Law Olmsted plan for a grand park became even grander as famed architects Daniel Burnham and Edward Bennett expanded on Olmsted's ideas and incorporated elements of the City Beautiful Movement into its design. Gambling? No.-Stop by The Night Train to wish Amy well as she plans her wedding at the beautiful Casino building on Detroit's Belle Isle. Amy tells us that Frederick Law Olmsted, a champion of the City Beautiful Movement, planned most of Belle Isle, although the city rejected his plan for a sheltered promenade. His son later suggested that the casino building include some of the features of the promenade originally suggested by his father. 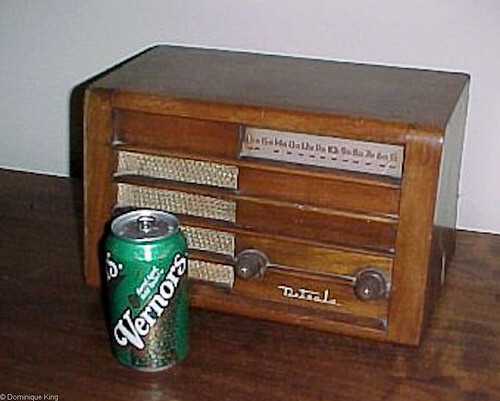 Raise a Glass on 313: National Vernors Day-Kath writes about this day dedicated to Detroit's own "deliciously different" soft drink at Great Lakes Gazette. Detroit area ex-pats often go to great lengths to satisfy their craving for Vernors if they can't find it where they live, and I used to carefully pack and ship 12-packs of the pop (yes, it's "pop", not "soda") to my cousin in California until she finally found a local source for Vernors. Ask any Detroiter--if it's not Vernors, it's not real ginger ale. The Oldest Ford Plant Still in Operation-I recently saw a presentation a local history conference by a group seeking to preserve portions of the historic Ford plant in Highland Park, Michigan, which pioneered modern mass production with the first continuously moving assembly line in 1913. Ford closed down operations at the Highland Park plant years ago, but check out this story at the Nokohaha blog about a 1924-vintage Ford factory in St. Paul, Minnesota, that now holds the distinction of being the oldest Ford plant still operating. Bridges of Madison County (and beyond)-I enjoyed Linda's story about visiting Iowa's famed Bridges of Madison County at Travels with Children. 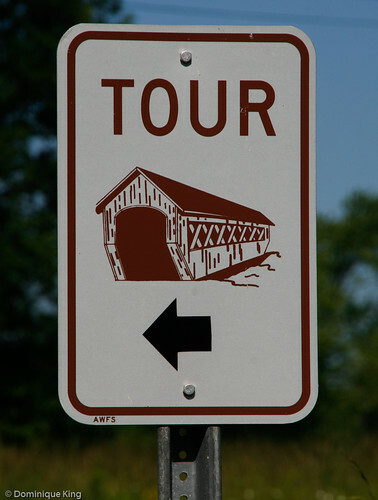 She also includes a few other useful links for finding covered bridges in the Midwest. Monkey Business in Rockford, Illinois-I always wanted a sock monkey as a kid (in fact, I still do! ), but maybe I just need to visit Nelson the world's largest sock monkey in Rockford. 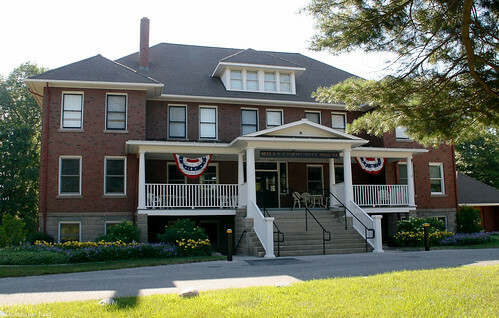 Julie writes about her visit with Nelson at the Midway Village Museum and other Rockford attractions at Road Trips for Families. Musings on Museums-Amy writes about visiting one of Laura Ingalls Wilder's childhood homes in Walnut Grove, Minnesota, at A Closer Look at Flyover Land. She found the museum there a little disappointing, but advises that fans of Laura's books will find the Ingalls family dugout home site well worth the stop. Keeping the Union (and Ohio's Civil War History) Alive-It was all in the family for Kyle Yoho as he grew up the only child of parents who shared their love of historical re-enactments with him. The 21-year-old still travels the country as a member of one of Ohio's most active Civil War re-enactment groups and shares his thoughts with Discovering Ohio's Ashley about why young people continue to enjoy the hobby as we move into celebrations of the Civil War Sesquicentennial. Helen Steiner Rice: Ohio's "Ambassador of Sunshine"
I remember seeing gift books and greeting cards in card shops bearing the name of Helen Steiner Rice, and I remember seeing a few photos of her as an elderly lady who invariably wore a fancy hat. 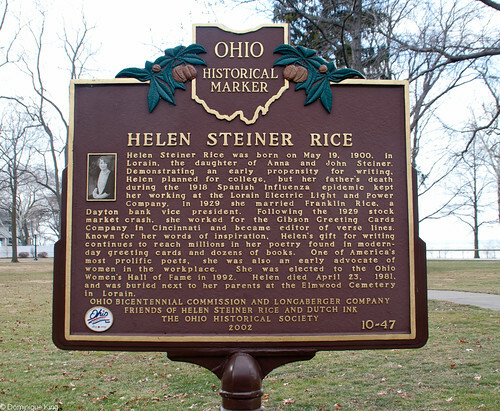 I was surprised, though, to see her name on an Ohio historical marker in a Lorain, Ohio, park during our most recent trip along Lake Erie on Ohio's north coast. 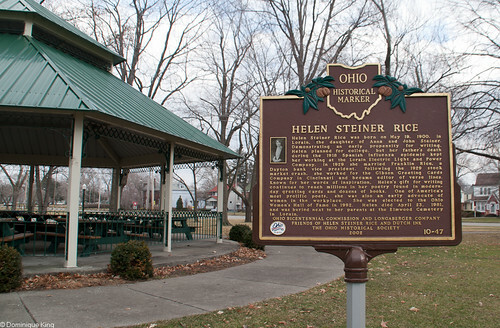 Helen Elaine Steiner was born at Lorain on May 19, 1900. Helen taught religion classes at her local Methodist Church, originally thinking she might like to be a preacher. She liked to write, and had some of her earliest poems published in her school newspapers. Helen planned to attend Ohio Wesleyan College for a liberal arts degree, study at Ohio State to earn a law degree, and expressed a desire to become a Congresswoman, inspired, no doubt, by the election of Jeannette Rankin of Montana as the first female member of Congress in 1916. Her father, a railroad worker for the Baltimore and Ohio Railroad, died during the influenza epidemic of 1918, and Helen gave up her college plans to work at the Lorain Electric Light & Power Company making decorative silk lampshades to support her family after her high school graduation that same year. Company officials spotted promise in Helen and trained her as a bookkeeper, but her real talent was in marketing and speaking. She eventually became the company's advertising sales manager, which was a rare career for women in the 1920s. Helen also was the electric company's spokeswoman and chair of Ohio's Women's Public Information Committee of the Electric Light Association. She became a nationally known speaker by age 25 and also used her speaking engagements to advocate improved working conditions and workplace rights for women. In 1927, Helen started her own speakers bureau called Steiner Service. Helen spoke at a bankers' convention in June of 1928 where she met Franklin Rice, vice president of Dayton Savings and Trust. She married him on January 30, 1929, and moved into Franklin's grand 14-room house in Dayton. The stock market crash in October of 1929 cost Franklin his job, as well as his investments. In 1931, Helen accepted a job with the Gibson Art Company of Cincinnati as a trouble shooter suggesting ways for the company to increase sales in its greeting card division. Franklin refused to sell his home in Dayton, Ohio, so Helen lived in Cincinnati during the week, commuting back to Dayton on weekends. Franklin became increasingly depressed about their financial difficulties and committed suicide on October 14, 1932. Helen worked and lived in Cincinnati after Franklin's death, becoming one of America's leading greeting card writers by 1940. Helen wrote "When I Must Leave You" when her mother died in 1945. The poem became a popular sympathy card for Gibson, and the company began publishing more of Helen's signed inspirational verses on greeting cards. The popularity of Helen's inspirational verse soared after 1960 after a reading of one of her poems on the Lawrence Welk Show. She authored ten books during her lifetime, usually sending her royalties to churches she attended in Lorain and Cincinnati. Helen retired from full-time work at Gibson in 1971. Her health deteriorated during the 1970s, and she died on April 23, 1981. Her grave is in the Steiner family plot at Elmwood Cemetery in Lorain. 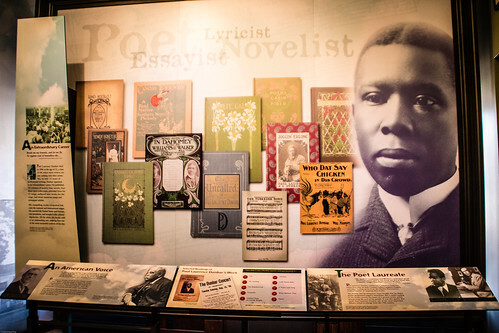 Helen wrote an estimated several million poems during her lifetime. Her poetry continues to sell well, and the foundation she established before her death donates money to a variety of charities helping those in need and the elderly primarily in the Lorain and Cincinnati area. In 2002, Ohio installed the marker we saw in Lakeview Park commemorating the life of the woman many called the "Poet Laureate of Inspirational Verse" or the "Ambassador of Sunshine". So, next time I see Helen's name on a sentimental greeting card, book mark, or gift book, I'll have a greater appreciation of her work and life as a tough-minded pioneering businesswoman who liked to wear fancy hats! Want to learn more? Check out Helen Steiner Rice: Ambassador of Sunshine by Ronald Pollitt and Virginia Wiltse or A Portrait of Helen Steiner Rice by Mary Hilarie Tavenner. Some of the most recent releases of Helen's collected poetry and devotionals include A Celebration of God's Love, A Collection of Joy, A Celebration of Love. I've never been much of a reader of mysteries, although I often enjoy reading a decent true crime book. These days, however, I find myself reading a lot of both fictional mysteries and true crime books written by Michigan authors and/or set in the Great Lakes State. So, whether you like escaping from the slush and cold by reading a chiller, or you're looking for a few good reads to pack into your beach bag in anticipation of summer, here are a few suggestions for books about Michigan mysteries, murder and other mayhem. Taking a new look at cold cases always fascinates me, and I found Mardi Link's account of an officially unsolved northern Michigan crime dating to 1968, when an idyllic summer vacation home turned into a horrific murder scene where six members of the Robison family lost their lives, fascinating. Fans of the "Mad Men" television show should also enjoy reading about some real-life 1960s advertising types populating this story. I saw Link at a book signing where I picked up her next true crime book about another northern Michigan case where she explores the long-held secrets about a nun's death in the tiny northern Michigan town of Isadore-a crime that the locals still only reluctantly, if at all, discuss. Lest you think tragedies like Columbine and Virginia Tech, where one or two disturbed or disgruntled people take the lives of students as they set about their school day, are unique to our contemporary culture, Arnie Bernstein's book about America's first school bombing that took place in a mid-Michigan town on a spring day in 1927 will be a revelation. Readers learn how the bombing happened, but the reasons for the crime spree that resulted in the deaths nearly 40 people (including the bomber himself) remain shrouded in mystery. I remember reading newspaper accounts about the deaths of two Detroit-area deer hunters who disappeared during a hunting trip in 1985, as well as the trial that exposed the secrets surrounding their deaths 18 years later. Tom Henderson's book, Darker than Night, is a compelling account of the crime and trial that even earned a 5-star review at Amazon from the prosecutor in the trial. Chapters are extremely short, which I found an effective device to keep me moving through the book as I'd always think I would read just one more chapter...and keep thinking that until I finished the book hours later. I look forward to reading Henderson's other true-crime books. Richard Carson's book about the death of a 17-year-old girl from Michigan's Thumb area in 1974 is in my "to-read" pile. This case remained unsolved until a rookie detective began investigating it with the assistance of a psychic in 1982. I'm looking forward to reading about the crime, the subsequent trial, and the trial's aftermath. Pulitzer-Prize winning journalist Bryan Gruley gave me the ultimate trifecta of reasons to read his first mystery novel when I saw that he set it in northern Michigan with a protagonist who played hockey and wrote for a weekly newspaper. I buzzed through Gruley's first book about Gus Carpenter and the northern Michigan town of Starvation Lake, both of which have seen better days, and immediately bought and read the next book in the series. There is a nice Q&A with Gruley at the Traverse City National Writers Series site (you can get to it by clicking on the story link in the "Meet the Writer" column or find it by entering "Bryan Gruley" in the site's search box). And, of course, I would be remiss if I didn't mention my friend Elizabeth Kane Buzzelli's Emily Kincaid Mysteries, where struggling writer, journalist and amateur sleuth Emily Kincaid teams up with her friend and small-town deputy, Dolly Wakowski, to solve mysterious cases in a small northern Michigan town. Be sure to check out my Q&A with Elizabeth for some insight into her three published Emily Kincaid books and a sneak peek at Elizabeth's next mystery series. Meanwhile, I'm anxiously awaiting the release of Elizabeth's fourth Emily Kincaid mystery, Dead Dogs and Englishmen, due out in July, 2011. Readers can meet Elizabeth in person on July 22 at a book launch and signing at Brilliant Books in Sutton's Bay, Michigan. I also posted some more great Midwest reads late last year at Midwest books make for good reads and great gifts. There isn't much better on a cold winter evening than curling up with a good mystery, and reading Elizabeth Kane Buzzelli's stories about struggling mystery writer Emily Kincaid and her adventures in small-town northern Michigan is a special treat for me. 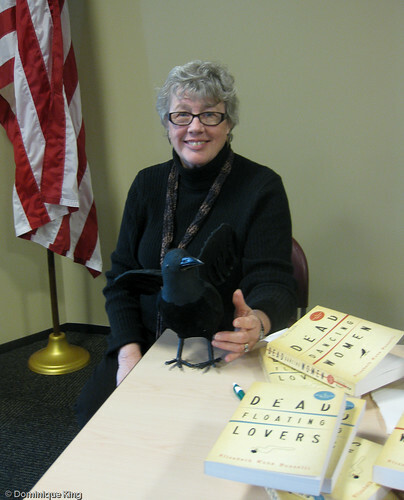 Elizabeth teaches creative writing at Northwestern Michigan College in Traverse City, Michigan, when she's not writing novels or figuring out what to do with the bad guys in her fictional worlds. 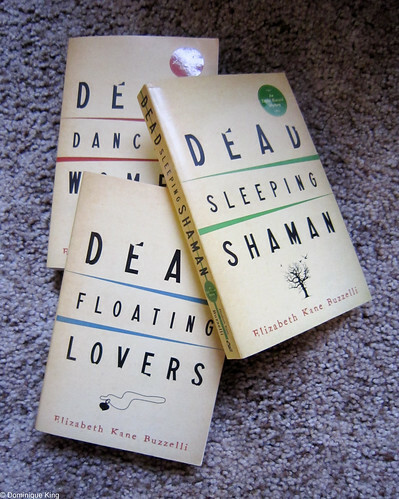 The Emily Kincaid series includes Dead Dancing Women, Dead Floating Lovers, and Dead Sleeping Shaman, as well as Dead Dogs and Englishmen (slated for release in spring of 2011). Elizabeth, who I met at a metro Detroit writers' group meeting, took some time out from writing her most recent novel to answer a few questions for me. Q. 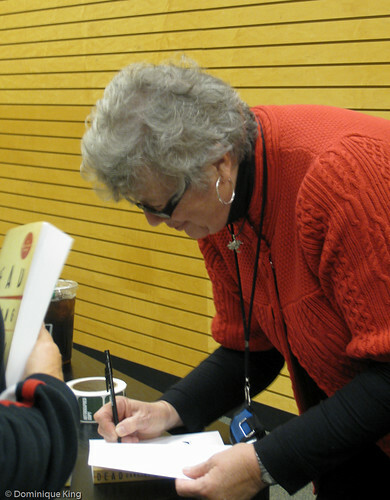 How did Emily Kincaid introduce herself to you and become the lead character of your northern Michigan mystery series? A. I think Emily Kincaid split off from my psyche. She's a mystery writer, lives in my house, uses my writing studio, has a dog a lot like my old dog, keeps getting into trouble. Only she's a lot younger, a lot smarter, a lot dumber, a lot more put-upon. Oh, and she doesn't weigh much. Yeah--just like me. Q. How did the northern Michigan setting inspire or drive these stories? A. Northern Michigan is a place out of time--at least where I live. The people are real--without the hang-up of proving how much money they have, who they know, which schools they attended--nothing but reality, real lives in progress, up here. The towns I write about are much as I write them. The people care about each other and sometimes hurt each other. Deward, the abandoned mining town in Dead Sleeping Shaman, is real and haunted and a part of a colorful past. Leetsville is no more, but could have been--if it had survived the end of logging days the way other towns survived. So, I breathed life into Leetsville. Traverse City is the antithesis of my other places--it is alive and growing and wealthy, and culturally and artistically viable. I have it all up here--and along with that some evil people who I like disposing of. Q. How did crows become harbingers of danger in your books? A. Actually the crows aren't harbingers of anything but more crow smarts. They've been my muse since moving up here, and one time they saved my life. They look out for me and gossip about me and hang around my house. Since taking on the rehabilitation of the crows I have been told amazing stories by people in up close and personal encounters with the birds. Amazing creatures. For me they've become a harbinger of more and more ideas for mysteries. Q. It's been interesting to see the growth of Emily's character, and her relationships with other characters, as the series progressed. I admit that her relationship with her ex-husband in the second book made me want to shake a bit of sense into her, though. How can we expect to see these characters progress in the next book in the series? A. A lot of people got mad at Emily when she went back to her cheating ex-husband, Jackson, temporarily. The thing is, I'm tired of fairy tales in women's novels. Sorry, but women can do dumb things when they're scared or too lonely. They return to men who are bad for them--as Emily did when her finances were scaring her. But the thing is, they can learn from their mistakes, as Emily did--she wasn't going to leave northern Michigan. She wasn't going back with Jackson. She was actually getting what she wanted and would find a way to make it work. She got stronger through her temporary insanity. Q. When is the fourth book in the Emily Kincaid series coming out? A. The next book in the Emily Kincaid series will be out in May, 2011. Dead Dogs and Englishmen is about facing someone so evil you doubt your own sanity. And here, too, Emily is forced into a situation she wished she weren't in, but needs the money she makes to pay her bills. Another lesson learned by Emily, who comes out of it wiser and even rather proud of what she did and who she is. Q. Do you have any plans for Emily beyond these four books? A. I have two more books in the Emily Kincaid series in the works but at the moment I'm taking a break. Emily and Dolly want to get away from me for awhile and I need to see less of them for a year or so. The thing is, people up here keep coming to me with stories. I just got a phone call from a man who ran into this great story . . . so . . .
A. At the moment I'm working on a novel very unlike the DEAD series. It is much darker, much more threatening, and takes place in Detroit, among the homeless. My protagonist is a woman--Roberta Brimley, a social worker who joins the homeless (the faceless, unseen people) when she is threatened by a madman who murdered her husband, a philosopher, and has come after her, first stalking and torturing her, to find something her dead husband had hidden. I'm always excited by new work and can't keep it out of my mind. I'm on chapter 23--pushing forward but already looking to the end, when I get to do away with the bad guy in as gruesome a manner as I can come up with. Sins must be paid for, after all. Thanks, Elizabeth, and I'll be sure to look for your next novels! Meanwhile, are you curious about Emily, love a good mystery, and love discovering great regional authors? Be sure to check out Dead Dancing Women, Dead Floating Lovers, and Dead Sleeping Shaman. World's Largest Toilet, Columbus, IN-The term "go big or go home" takes on a whole new meaning with Julie's post about this, um, pit stop at the Kids' Commons Columbus' Community Children's Museum in Columbus, Indiana on the aptly named Go Big or Go Home blog. 20 Things to Do in Grand Rapids Before You're Dead-Great Lakes Guru Tim shares some great ideas for visiting this west Michigan city, including some of my favorites like ArtPrize, the Grand Rapids Art Museum (a.k.a. the GRAM), and the public art-filled campus at Grand Valley State University. Art at the Indianapolis International Airport-Stuck at the Indianapolis airport while waiting for a flight? Nicole suggests checking out the airport's great collection of public art and sleek modern architecture in her recent Indiana Insider blog post. 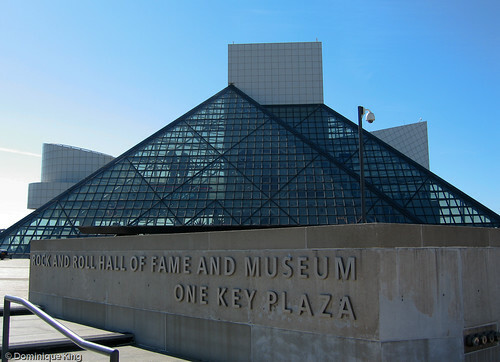 Rock and Roll of Fame and Museum-Check out this story about the Cleveland, Ohio, museum at What Locals Like About Cleveland Plus. The short video tour gives you a sneak peek inside of the museum, including a quick look at my favorite part of the museum--its collection of performers' stage costumes (something I haven't been able to do on Midwest Guest because of the museum's photography restrictions for visitors). A little trip up north...and Thomas Story Kirkbride-We've enjoyed several photowalks with Photowalks Detroit. I enjoyed seeing Carolyn's story on Michigan in Pictures about a photowalk at the Village at Grand Traverse Commons in Traverse City, a former mental hospital in and ongoing residential/commercial development. Be sure to check out the links in this story to see some great pictures in the Flickr streams from individual photographers involved in this photowalk. Drinking and Drawing in Chicago-These informal, after-hours art sessions in several Chicago studios and galleries sound like great fun. Join Rosalind at Uptake as she checks out several events that involve creativity and cocktails! Schlitz Fest-Read Designslinger to find out how German-born Milwaukee brewer Joseph Schiltz sent thousands of barrels of beer to thirsty folks in Chicago in the wake of the big 1871 fire. German expats there, grateful for the free beer, probably helped the company's expansion into Chicago and the establishment of these architecturally beautiful Schlitz taverns during the late 1800s/early 1900s. 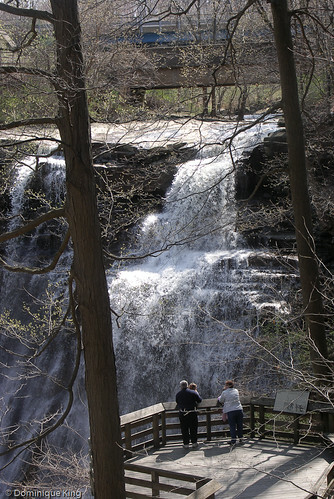 A Road Trip to...Brandywine Falls-Anthony of Ohio's Stark County News & Views takes us to Brandywine Falls at the Cuyahoga Valley National Park. This story brought back fond memories of our visit to this beautiful spot. Road Trip: Finding Oz in South Dakota-Kristen shares the story of author L. Frank Baum's beloved book, The Wonderful Wizard of Oz, and its surprising connection to Aberdeen, South Dakota. This is one in a series of Midwest Road Trip posts at Vera's A Traveler's Library blog involving books and movies with Midwestern connections (including A Road Trip to an Ordinary State: Kansas, where Vera shares the story of Truman Capote's book In Cold Blood, the movie based on the book, and the lurid crime that inspired both of them). Be sure to check out companion posts to this series at Music Road where Kerry suggests musical selections to accompany the Road Trip posts. Here's a link to Kerry's suggestions for tunes to accompany the Nebraska and Kansas leg of the trip. It's Buster's Birthday-Classic comedy fans will want to visit Muskegon, Michigan, where the incomparable Buster Keaton and his family called home during summers while preparing to travel the vaudeville circuit the rest of the year. Check out the Great Lakes Gazette where Kath shares the story of the Keaton family, the area's early 1900s Actors' Colony, and an annual festival dedicated to the great silent movie actor and filmmaker. I’m sharing a couple more photos from our recent visit to author and naturalist Gene Stratton Porter’s home in Rome City, Indiana. 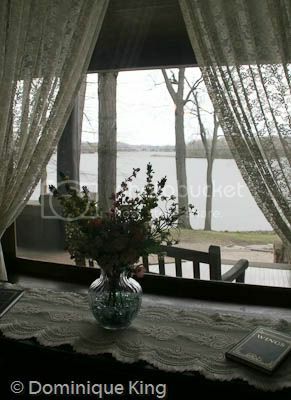 Gene treasured her time on Lake Sylvan and when she designed her home there, according to our tour guide at the site, she included what she called her “Million-Dollar window” in the parlor to best showcase the lake view. 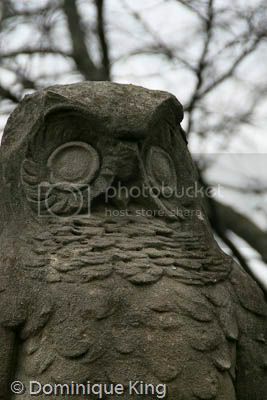 I also loved a pair of owl statues perched atop columns flanking the drive leading through the woods to the house, so I’m including this shot of one of those wise old birds. Read more about our visit to the Gene Stratton Porter home in my story from last week, Indiana in bloom at Limberlost North. We were fortunate enough to visit the home just as the wildflowers started to bloom in Gene’s gardens. Check out a few more photos to see what’s blooming at Limberlost North this spring in my Photo Friday post from last week.